As one of the most highly anticipated Xbox exclusives in recent memory, Sea of Thieves released with a lot of goodwill and even more pressure to deliver on the promise of Xbox Game Pass, to make up for the current lack of Xbox exclusives arriving in 2018. 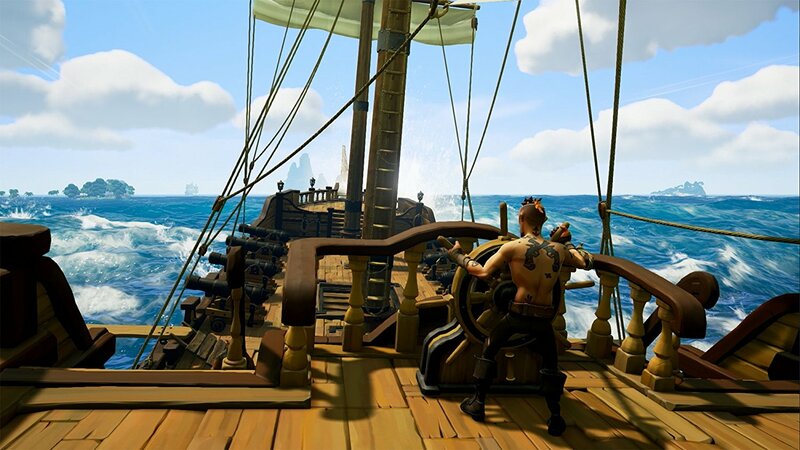 Rare’s open world pirate game saw a lot of exposure throughout a long alpha and extensive beta, but does Sea of Thieves’ release version meet fans’ hopes and expectations? Despite some flaws, Sea of Thieves provides a fun, original experience on the Xbox One that should reward imagination and teamwork with other players. The premise of Sea of Thieves is that you are a pirate seeking to achieve the status of Pirate Legend, setting sail with your friends to work together to achieve that goal. That’s it. There’s no story to drive you, no set line of ‘go here and do this’, then ‘go there and do that’ to follow. Sure, there are missions to embark on, but in the end Sea of Thieves is a game that is what you make it. Your imagination and willingness to divert from original plans will ultimately define your experience. Sea of Thieves received a fair amount of criticism at launch, and it’s appropriate to address those concerns first. Fan concerns over the game can essentially be lumped into two categories: lack of customization and lack of content for players. As for customization, the complaints regarding the relative lack of cosmetic options are fair if Rare fails to support the game with any special or themed additions to the list of items currently available. Considering Rare’s willingness to listen and respond to fan feedback throughout the development of Sea of Thieves, I think they’ve earned a “let’s wait and see” approach rather than downright outrage on release day. Before jumping into the amount (or lack thereof) of customization and cosmetic items available in Sea of Thieves at launch, it’s important to note that the customization options when it comes to your actual pirate are virtually endless. When first loading up Sea of Thieves, you’ll be presented with eight possible pirates to select from, and you’ll be able to generate new pirates to choose from repeatedly until you settle on the one you want to be. You are even able to save pirates that you are interested in while you look at additional characters until you’ve made your final decision. Aside from the perceived lack of cosmetic options available, the cost of many of them has also drawn the ire of a fair amount of players. Make no mistake – it can be a serious grind to acquire some of the items in Sea of Thieves. However, when you listen to the criticism, what players are often saying is that in order to unlock these cosmetic items, you have to engage in a repeated cycle of quests that makes the game mundane and extremely repetitive. This point is completely fair, if you’re a certain type of player. Meaning, if you’re the type of gamer that likes to have a clear path of things to do at all times and likes to always be working towards something specific, then Sea of Thieves will leave you with a sour taste in your mouth. You’ll likely feel that you’re doing repetitive missions in order to save up enough coins to purchase the next cosmetic item you want. 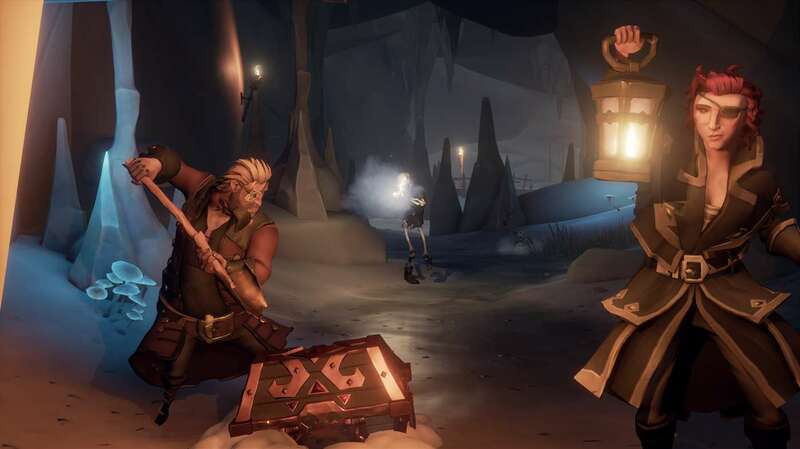 It is this that has left some players feeling that there is a serious lack of content in Sea of Thieves, and that the game will lose a lot of its player base quickly. Because the primary way to earn coins is to complete voyages (quests) for the Gold Hoarders, Merchant Alliance, or Order of Souls, the experience can have a definite feel of go here, do this… then go there, and do it again. However, there are other ways to acquire gold in Sea of Thieves. For instance, you can explore shipwrecks, which are revealed by birds circling in the sky above them. When exploring one shipwreck, I found a chest called the Chest of 1000 Grogs, which made my pirate super intoxicated whenever it was held. Just getting it onto the ship was a challenge, and a friend fell off the dock repeatedly when we were trying to turn it in. These chests are often worth far more than the average voyage, and offer some variation when earning coins. Another way to earn coins is to travel to skull islands, which are located below skull-shaped clouds in the sky. When there, skeleton enemies are intense, and it requires strategy to successfully leave the island with treasure to turn in. Not just strategy in terms of how to defeat the AI enemies, but also strategy around how to deal with other human players that will sail their crews to the island. Whether they will work with you, attack you, or work with you then turn on you, depends on who you run into and how you communicate with them. 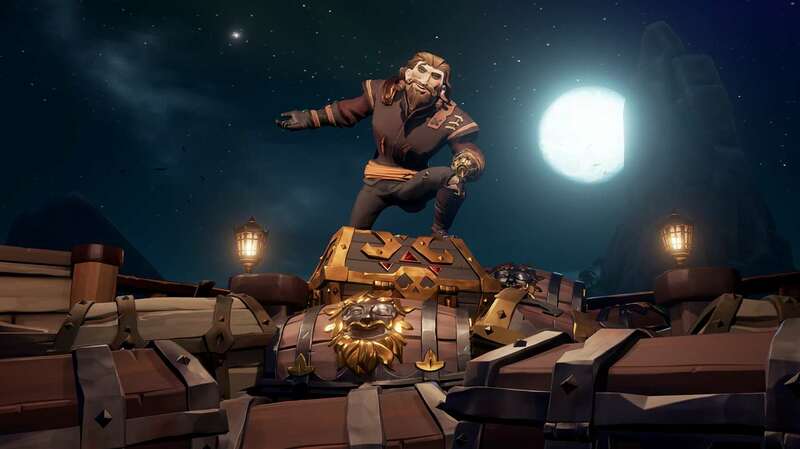 When other players worked together with my crew and we each got part of the extensive treasure available at the fortress, it has turned out to be extremely enjoyable and made time playing Sea of Thieves fly by. However, when that isn’t the case, the experience becomes incredibly frustrating because of a glaring issue in the game – griefing. Rare has fixed the griefing issue right before the publication of this review, but at launch it was a significant problem for a couple of reasons. First, it is really difficult to enjoy the game if you’re a player just wanting to have a good time with a friend or three when others just want to take advantage and sink you over and over. There were a couple of instances where we were having a great time playing Sea of Thieves, only to run into this and turn the game off within a half hour. Some of this is the responsibility of players to not outright ruin the experience of others by griefing, but a share of responsibility lies with Rare for allowing it to happen. Until the most recent update, when you travelled to Davy Jones’ Locker, you and your party would respawn at the closest island – within easy sight of the ship that sunk you, resulting in them coming to sink you again. And again. Imagine this scenario when you’re playing with one friend on a sloop, while another group is griefing you using a galleon. It ruins everything that is good about Sea of Thieves pretty quickly. For this reason, it is highly recommended that you play with enough people to sail on a galleon. Otherwise, you’ll find yourself not able to explore many of the options Sea of Thieves offers, and will instead play a very repetitive voyage based game. Despite these issues and concerns, Sea of Thieves is a really fun experience. In the twenty hours plus that I have put into the game, Sea of Thieves has largely delivered on its promise and has given me a fun escape. Among the reasons for this is the world that Rare has crafted for Sea of Thieves. The outposts are alive and offer the feel of pirate life, and there are more than enough islands to keep players travelling to new places. Some islands are small and bare, while others are much larger and offer caves and other things to explore. Each has resources that you will need, such as planks to repair your ship, bananas to restore health, and precious cannonballs for the event that you have to engage in battle. 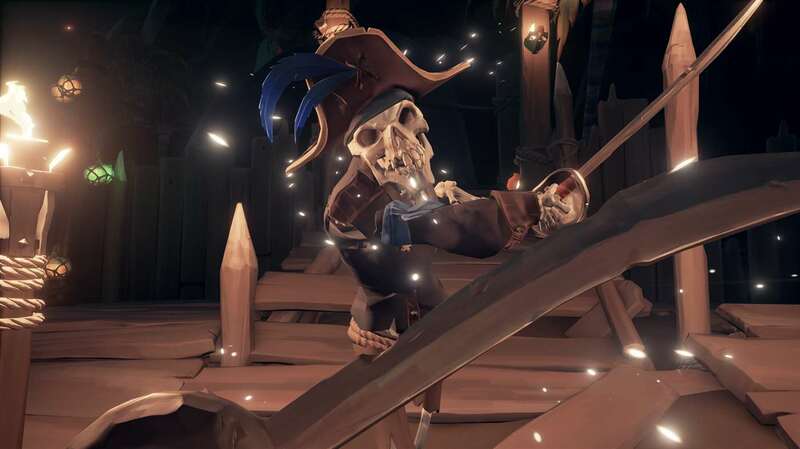 Rare has created a world that feels alive, with chickens, skeletons, and snakes occupying the islands, and sharks swimming beneath the surface of the sea. Ultimately, the goal in Sea of Thieves is to achieve the status of Pirate Legend. To accomplish this, you’ll need to level up your reputation with each of the three factions to Level 50. Once this has been accomplished, you’ll gain access to a special island for players that have reached the rank of Pirate Legend, along with all the spoils of that rank. This includes more personalized ships – one that is yours, not the generic galleon or sloop. Again though, if you are in a hurry to achieve Pirate Legend rank as fast as possible, you’re missing out on the fun of Sea of Thieves. 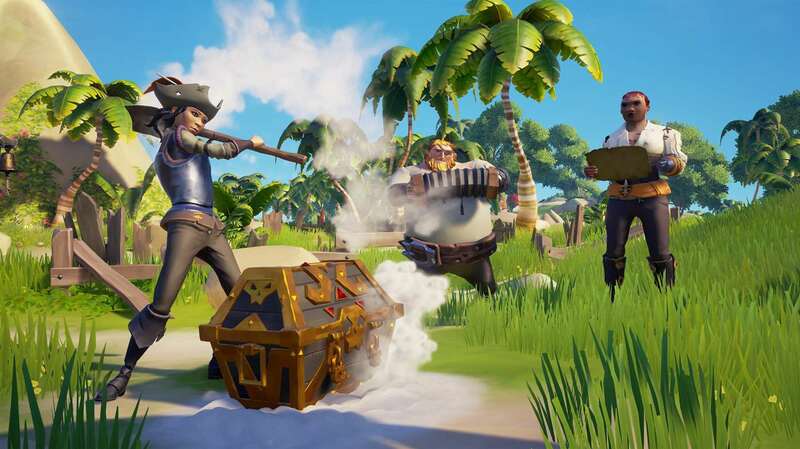 Rare’s pirate adventure is a much more fun experience when players allow themselves to be diverted from the linear quest path and define their own adventure on any given day, rather than complete quest after quest in a rush to reach Level 50. In this sense, when playing Sea of Thieves the way it is intended by the developer, it will take some time to reach Level 50. The amount of detail Rare have put into Sea of Thieves is impressive and adds to the experience at every turn. As part of a crew, you are responsible for the operation of your vessel, and almost everything on the ship can be interacted with. Trying to avoid another ship while sailing at night? You had better extinguish all your lamps on your ship, or you will be easily spotted. Having a tough time seeing your navigational map at night? A friend holding their lantern up over it next to you will be extremely helpful. Did you drop anchor while going too fast? You’ll be repairing your ship so you don’t sink. You’ll also have to get your sails pointed the right way to take advantage of the wind direction, know that aiming at the bottom of enemy ships causes much more damage, and realize that using your spyglass to look at another ship can easily give you and your crewmates away. These, and lots of other small details, make every task feel like it has purpose and make Sea of Thieves that much more fun. Visually, Sea of Thieves looks absolutely stunning in 4K on the Xbox One X. On a clear day, the water looks amazing, and the sky will light up in different ways at night, ranging from a brilliant sunset full of reds and oranges at dusk, to the greens of the Northern Lights at night. The reflection of the moonlight off the water on a clear night is impressive, and the colors of the skull clouds provide an increasingly ominous feel the closer you get to the skeleton fort. The way the sky changes when you enter a storm system changes the feel and tone of the game. Finally, for something truly visually impressive, sail off the end of the map and discover what occurs. I won’t ruin it for anyone that hasn’t done it yet, but it’s a little creepy. The controls in Sea of Thieves are simple and responsive. You’ll use RT to use any item you’re holding in your hands, and access items to use with the bumpers. Pressing LB will give you a wheel of items to choose from, ranging from bananas to cannonballs to a shovel, and RB will deliver a wheel of maps that apply to whichever voyage you and your crewmates have voted for as the active quest. Using the X button will pick up items that you find on islands, such as bananas, cannonballs, and wooden planks, and the Y button will store each of those items in the appropriate holding area on your ship when you have that item selected. Selecting the LT will zoom in if you have a gun selected, and even turn your map around to show a friend if you have your map selected. While Sea of Thieves has its flaws, it is still a fun experience worth playing – if you are playing it a certain way. If you like solo or linear experiences, Sea of Thieves might not be a good choice for you at full price, because when playing solo or with just one friend, it is a repetitive and frustrating experience because of the griefing involved in the game, and the limitations that sailing in a smaller boat places on you. However, when sailing with a total crew of three or four pirates, Sea of Thieves is a blast. If you allow yourself to be diverted to the gameplay options besides the voyages, you and your friends will have a lot of fun playing Sea of Thieves. At its core, Sea of Thieves is a fun, innocent experience that rewards spontaneity and imagination, but becomes rather dull and repetitive if you want a linear experience. As part of Xbox Game Pass, Rare’s Sea of Thieves is more than worth the time you will put into it. Previous articleWWE items set to arrive in Rocket League during WrestleMania 34!